Chicken keeping has been, and always will be, laced with tragedy. Yesterday I turned my darlings out on the way to the deer stand so they could scratch about for a couple of hours before bedtime. As I sat nestled in my tree I could hear our neighbors shouting at their dogs, nothing out of the ordinary really. Not seeing any creatures other than a squirrel army and single rabbit I headed in about 5:30. Addie comes running to meet me half way back to the house “What is it” I ask her. Breathless, she tells me that something has gotten into the chickens, “It must have been a raccoon or a chicken snake!” she shrieked. From the description she gave me I knew a Brabanter was injured. One of the two Cream Brabanters we have. I quickened my pace and swung my rifle around in a very impressive John Wayne-like move, pointing it forward, grabbing the bolt-action and sliding it back. I was doing this in order to unload before attending to the crisis at hand. My neighbor, standing in the semi-darkness by my porch threw up his hands and said “Hey, I ‘m unarmed”. Poor thing, I hadn’t seem him and must have looked pretty threatening. He was there to tell me his dogs had gotten out and attacked my darlings. 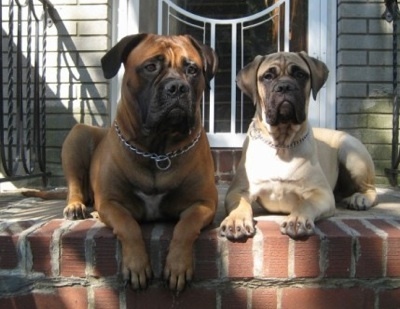 These are not his actual dogs but they look exactly like this. He was quick to offer replacements for any that might be deceased, however what he doesn’t understand is that you can’t replace a chicken. Not when they have been hand selected, special ordered and raised by yours truly. A nice thought but still, I asked him to wait while I went and checked on the patient. Addie had carefully picked it up, made it a towel nest in the laundry room and fetched it some water in a princess tea-cup. I love that girl. 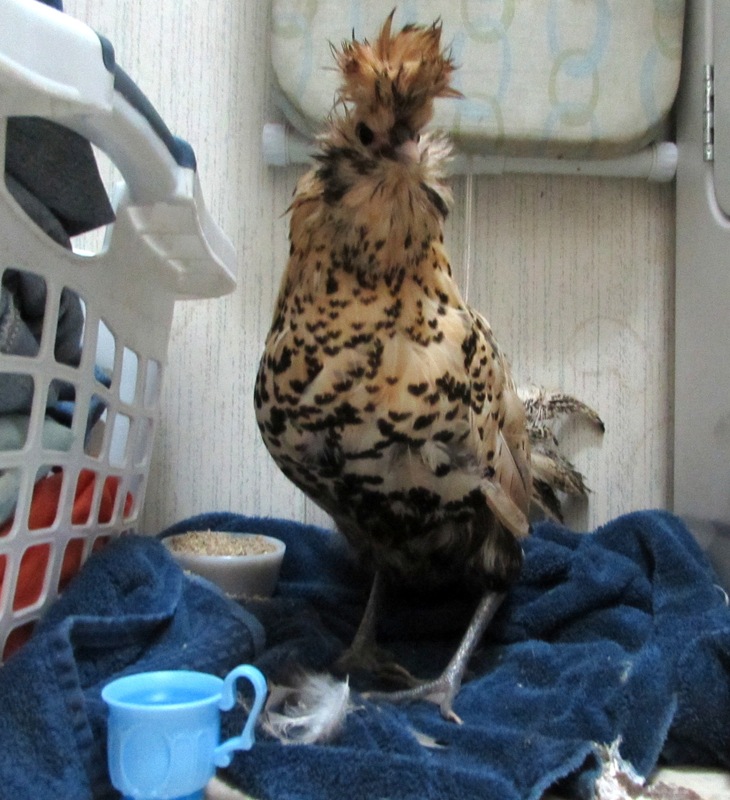 Amazingly, though wet, traumatized and missing a large amount of feathers, she was okay. 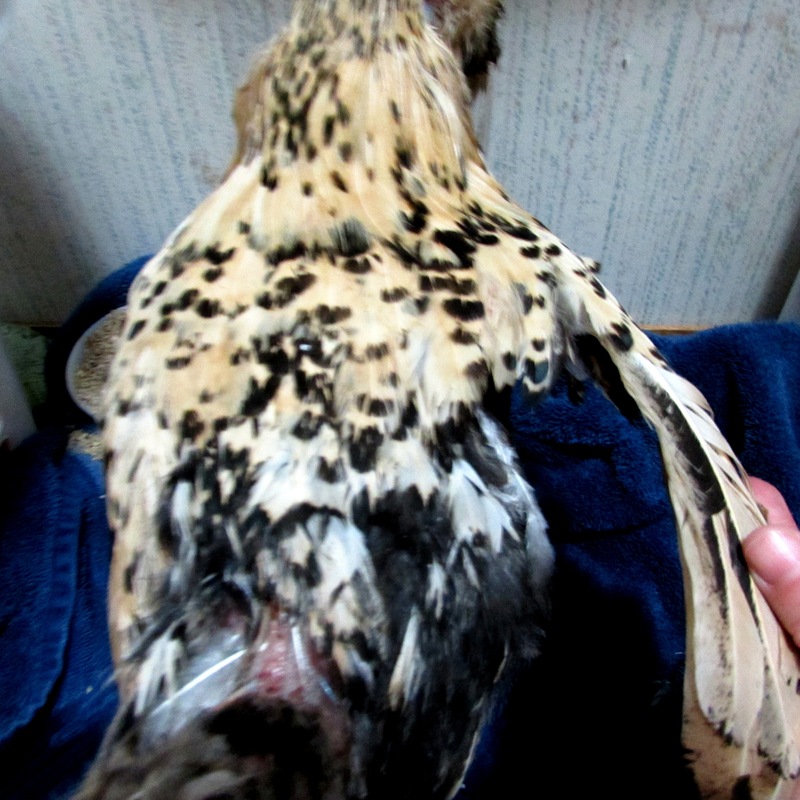 After applying some medicine and talking to her a moment I returned to my neighbor and with flashlights in hand, we went to the coop to make sure there were no more injuries. I made a most careful count and all were accounted for. 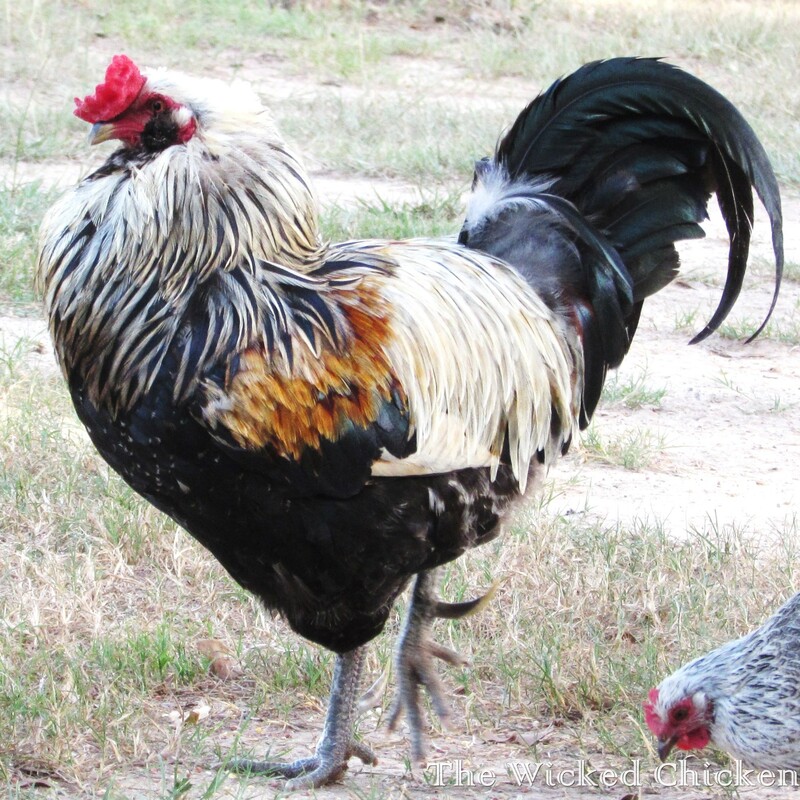 Randy, my old rooster, had made a good show of defense and lost most of his beautiful tails feathers as a result. Those massive spurs finally came in handy. So Mrs. Branbanter is spending the day in recovery (otherwise known as the master bath). I am hoping she doesn’t fly out and considering her wing injury I doubt she is able to. I am so thankful no lives were lost and feathers grow back. ← When you give a teenager cake…. ughhhhh, but I am impressed that they did show up and offer ‘replacement’ (although we know there is no such thing). That’s not good! I have some chicken antibiotic handy if you need some, but doesn’t look too bad. It is simply amazing she isn’t seriously injured. The skin is only broken in one place that I can find, she will go back outside tonight or tomorrow. And the neighbor was was very nice and remorseful. Unlike most neighbors…. so that is a good thing. Glad you didn’t plug the neighbor (probably not as glad as he was), but I’ll bet he keeps a closer eye on his dogs from here on out! 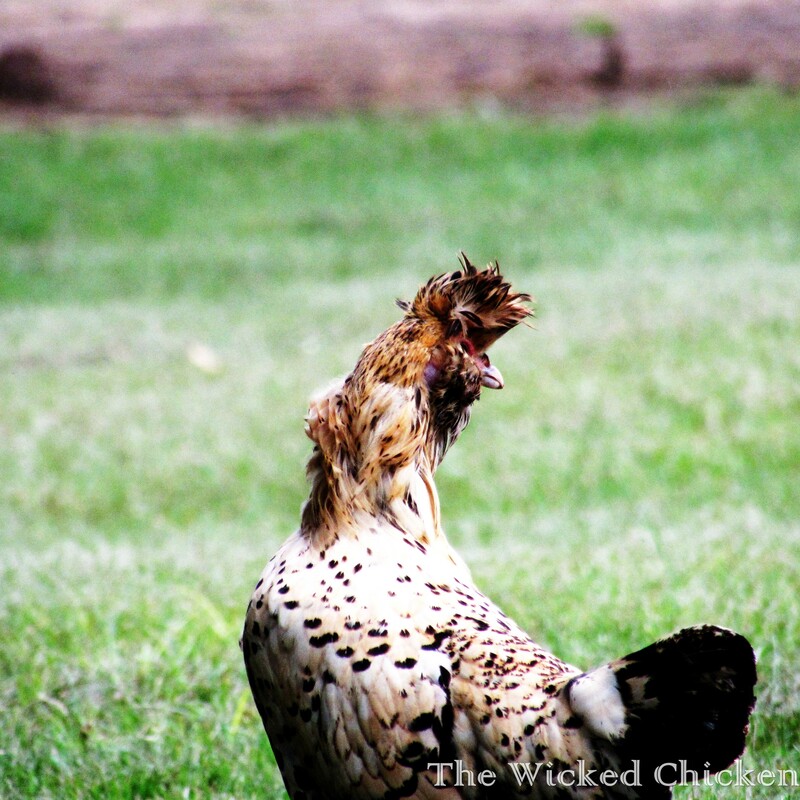 Hope they don’t come back…maybe your rooster put some fear into them! Nature is a cruel thing. I don’t know if it’s worse if it’s your own dog or your neighbour’s (my dog once attacked one of my ducklings while he was on the lead and my attention was on the other ducks) but a little remorse from the owners goes a long way. I’m so glad your hen is ok. (She is so pretty, by the way.) And it is nice to have a remorseful neighbor…. Oh my! I’m glad no lives were lost.